RÁBADE, Spain — After a decade of working on luxury cruise ships in the Bahamas, Jeff King, 60, and Claudia Weber, 50, decided they’d had enough of Caribbean sun, tourism and mosquitoes. 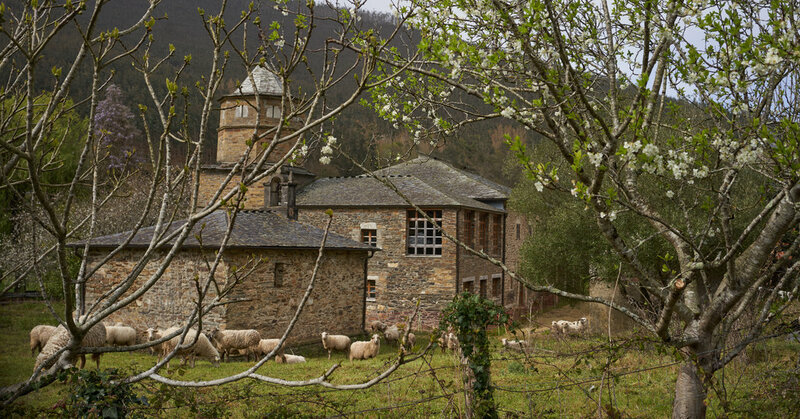 A former ship’s captain and a cook, they decided to drive around northern Spain in search of a quiet place to settle down — an old farmhouse, perhaps, or an abandoned mill. When they stumbled across an entire ruined hamlet up for sale, they were smitten. Their decision two years ago to buy an entire village is still rare, but getting less so. For less than 300,000 euros, or about $336,000, they bought a cluster of crumbling stone houses with slate roofs, set on 12 acres of woodland dotted with chestnut, oak and apple trees. “There is just so much space,” Ms. Weber said, patting their horse, whose sole purpose is to eat the grass, so that neither she nor Mr. King needs to cut it. Though some Spaniards are beginning to invest in abandoned villages, it is mostly foreigners who are interested, said Pepe Rodil, a salesman at the real estate agency Aldeas Abandonadas. Gwyneth Paltrow gave the idea a shout-out last year, when she suggested on her blog, Goop, that one of the abandoned Spanish villages sold by Aldeas Abandonadas could make the perfect Christmas gift for a loved one. Despite being in dire need of a roof or two, the village in question was snapped up for €150,000 by Dutch investors, Mr. Rodil said. Dozens of such empty villages are listed in 10 languages on the Aldeas Abandonadas website. The going rate for a ruined hamlet is now close to €100,000. If you’re feeling flush, an entire village of 75 homes, all abandoned during the Spanish Civil War between 1936 and 1939, will set you back €425,000. For a couple of million, you could even purchase a medieval hilltop settlement with its own fortress. Mark Adkinson, who owns Galician Country Homes, the agency that sold Mr. King and Ms. Weber their hamlet, says entire villages are particularly popular with northern Europeans looking for retirement options or vacation homes. “There is a boom,” he said, contemplating the sea view from the ruined hamlet he sold for €312,000 in February to a young British family. Though the buildings are in a state of disrepair, the location is stunning. Hence the price tag. Wild boars forage for acorns on the land, which runs down to a sandy cove. “We wanted somewhere quiet, where our daughters could run free during the holidays,” the new owner, Rupert Evans, said from his London home. But he expects that his family will be camping on their land this summer, as it will take time to make the buildings habitable. While Spain’s cities are full of young people, struggling to find work that will enable them to pay sky-high urban rents, the countryside is cheap and empty. Not even the pristine roads that lead to many abandoned villages, thanks in part to European Union regional development funds, nor the 4G internet service that is available, attracts Spain’s young people. Successive governments have tried, unsuccessfully, to reverse the trend. As general elections loom on April 28, promises are being made to provide rural areas with more schools and medical centers. One party has even proposed a 60 percent reduction in income tax for inhabitants of rural areas. More than half of Spain’s villages are in the lush, northwestern region of Galicia. Daniel Herrera, a researcher at the Territorial Observatory at the University of Oviedo, said this is because a group of only two or three houses in Galicia can be considered a hamlet, whereas in other regions the bar is five or six. Mr. Herrera’s research group estimates that 1,789 villages are empty in Galicia. The figure for the entire country is 3,475. Rural depopulation began in Spain at the end of the 19th century, when small farming communities could no longer sustain families that were becoming bigger because of the decline in infant mortality. Some Spaniards sailed to the Americas to seek their fortunes. But it wasn’t until Gen. Francisco Franco industrialized Spain’s cities in the 1950s and ’60s, that there was a mass exodus from the countryside. It has taken Rosa and Neil Christie over a decade to restore the hamlet they bought for €45,000 in 2004. Mr. Christie, who had experience as a builder, brought his machinery with him from Britain. He admits that restoring his village has tested his engineering skills — not only has he had to put in windows and mend roofs, but he has had to build foundations and drainage systems. Fifteen years later, wooden beams crisscross the ceiling of their spacious country kitchen, which has a traditional cast-iron stove, neat shelves lined with china teapots and an under-floor heating system partially powered by solar and wind energy. Elegant French windows in the sitting room open onto the five-acre property, where deer can often be spotted. The Christies urge potential buyers to be patient. Though the local council has been helpful — it built a road connecting the village to the highway — obtaining licenses and permissions can take time, and it can be tough to maneuver through government bureaucracy if you don’t speak Spanish. Another consideration before purchasing a village is establishing ownership. While paperwork would normally be routine for an estate agent, it can be a tall order when dozens of potential heirs must be tracked down, and original documents are often damaged or even lost. “We must become detectives,” said Rosy Costoya, the wife and business partner of Mr. Adkinson of Galician Country Homes. It takes months or years to check whether a property can legally be sold. The Christies have never been able to confirm whether the owners of two ruined cottages at the far end of their village have living descendants. Buried in undergrowth and weeds, the ruins pose a health risk by attracting vermin, and are also a fire hazard. The Christies are waiting for the local council to decide what to do. “This is not for the fainthearted,” Mr. Christie said. There’s nothing fainthearted about Mr. King and Ms. Weber. Most of the buildings at Mr. King and Ms. Weber’s hamlet have not been inhabited for over 50 years. Broken desks are piled up on the floor of what was the schoolhouse; moss covers the walls of an old stone oven; iron hooks dangle from beams in one house where meat was hung to dry. In what is now Mr. King and Ms. Weber’s garden, a granary stands on stone stilts, and a stream trickles through the remains of the old laundry house where residents once washed clothes. They have renovated one cottage and rented it out to help pay the bills. Work is also underway to build a gymnasium, an open-plan kitchen and four en suite bedrooms in the largest, three-story house, where the couple hope one day to host paying guests for training camps or plant-based cookery courses. They still find time to enjoy the lifestyle, gathering giant mushrooms for lunch, climbing trees when grandchildren visit and settling down in the evening to light a fire in their wood-burning stove. Occasionally, they travel 17 miles to the nearest town, Viveiro, for a night out. They shop there once a week too, and every few days local merchants drive by selling bread, fish and gas. Garbage collection is once a week. “It’s not as isolated as you think,” Mr. King said.